To build the aluminum terrace and the carport, it often generally requests it from the trader. It is not as difficult as it was thought that it tried for myself. It is possible to proceed to the next step by acquiring the experience. It would be greatly appreciated when becoming reference when the aluminum terrace and the carport are built for myself. The aluminum terrace and the carport are bought. The aluminum terrace and the carport are sold by the mail order of the do-it-yourself store and the Internet. First of all, the plan your what kind of thing wanting to be made is developed. Width, length (depth), and height are decided by thinking about the area of the site and the relation to the building. Next, it chooses while comparing shape and the material to the budget. And, after it often thinks whether it is possible to construct it for myself, it orders. A necessary tool and the articles of consumption such as caulking are prepared besides the main body. First of all, the content of rough construction is understood roughly reading assembling instructions. Next, the relation to an actual building is confirmed while measuring. It is likely not to go according to the construction manual. It is necessary to be likely to remodel it. How construction is sped up is examined. 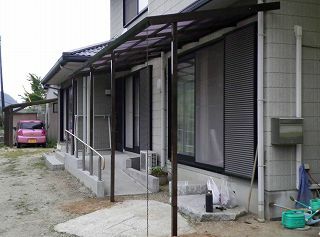 It is an aluminum terrace where this side of this photograph was completed. There are width about 7.2m, depth about 1.8m, height about 2.8m. There are a slope and a handrail for the physically handicapped person in the place that went out of the door. Moreover, there is a big garden stone in front of the living room. The position of the pillar has been greatly changed by this relation. In the left hand, there is a carport of the aluminum set up for myself. In this, the entrance is about 2.7m, depth about 4.8m. First of all, the rafter installation crosspiece is installed on the building. When the building is wooden, it installs it on a strong tree such as pillars in the building with the coach screw of Φ6X50. When the building is an iron frame, the iron frame pierces with a drill, and the rafter installation crosspiece is installed with the tapping screw etc. Please install it in the place with enough strength. Please do the caulking processing for the building and the rafter installation crosspiece. The installation of the pillar:Basic concrete. Next, the position of the pillar is decided. The position from the position of the rafter installation crosspiece to the pillar is automatically decided. If it makes a mistake in the position of the pillar, the roof becomes a parallelogram, the pillar inclines, and it positions it carefully. Especially, it is necessary to draw the line of the right angle from the building accurately. Which direction is lowered is decided by thinking about the drain of the water of the gutter. As a result, the burial size of the pillar changes. According to circumstances, the inclination of the rafter installation crosspiece changes, too. It digs up the hole of 30cm-50cm in depth to bury the pillar when the position is decided. I think that you should strike concrete after completing construction though the rubble is spread over the bottom and it pours concrete. The accuracy of construction for a wrong size cannot be secured when previously pouring concrete. Please install the anchor stick in the pillar. The pillar comes off easily when this is not installed or a concrete strike is not done. The rafter on both sides is installed on the pillar and the rafter installation crosspiece. Afterwards, a front frame (part that becomes a front gutter) is installed. When a front frame is installed, each rafter is installed. It is noted that there is directionality in the rafter. It doesn't tighten too much strongly though this tightening of the bolt nut is done after the angle of the roof is adjusted. Aluminum is transformed if it tightens strongly. Tightening is stopped when beginning to transform it. The installation of the field edge:Installation of the side frame. The field edge is installed on the rafter. This has directionality. The hook part where the corrugated plate is installed is made to come forward. Next, the reinforcement metal fittings are installed on the field edge. The side frame is installed on rafter installation crosspiece, a front frame, and the reinforcement metal fittings. There are a table and a back in this corrugated plate though the corrugated plate made of the polycarbonate is put from the edge. Please there must be a display in respect where the light of the sun is hit, and match the upper and lower direction and insert it in the rail of the terrace roof. The knack is needed for insertion in this rail for a moment. After the size of the blade makes the hole like Φ5mm by the drill, the hole of the hook in the under installs the hook. The installation interval of the hook is adjusted to about 20cm. Overlapping the joint in the corrugated plate and the corrugated plate is made one mountain half or two mountain half this time. This is written in the manual. If possible, I think that there should be a lot of piling suiting. In this case, the number of corrugated plates increases. I think that you should use the thing of 22mm made of the stainless steel by the hook. Strength and possession are greatly different. I did not use the thing made of plastic of the attachment. There is only remodeling when not assembled according to the drawing because of geographical features. The inclination of height and the roof of the aluminum terrace is changed as the position of the pillar is changed. The burial size of the pillar might be changed, and the installation method be changed.